It also supports Kerberos Realms, Kerberos Keytabs, and the ability to add additional parameters to Kerberos Settings. This section summarizes each of these services and their available configurations within the FreeNAS® GUI. Active Directory (AD) is a service for sharing resources in a Windows network. AD can be configured on a Windows server that is running Windows Server 2000 or higher or on a Unix-like operating system that is running Samba version 4. Since AD provides authentication and authorization services for the users in a network, it is not necessary to recreate these user accounts on the FreeNAS® system. Instead, configure the Active Directory service so that it can import the account information and imported users can be authorized to access the SMB shares on the FreeNAS® system. If the network has an NT4 domain controller, or any domain controller with a version earlier than Windows 2000, configure NT4 instead. Many changes and improvements have been made to Active Directory support within FreeNAS®. It is strongly recommended to update the system to the latest FreeNAS® 9.10.2 before attempting Active Directory integration. Before configuring the Active Directory service, ensure name resolution is properly configured by ping ing the domain name of the Active Directory domain controller from Shell on the FreeNAS® system. If the ping fails, check the DNS server and default gateway settings in Network → Global Configuration on the FreeNAS® system. Next, add a DNS record for the FreeNAS® system on the Windows server and verify that the hostname of the FreeNAS® system can be pinged from the domain controller. Figure 9.1.1 shows the screen that appears when Directory Service → Active Directory is chosen. Table 9.1.1 describes the configurable options. Some settings are only available in Advanced Mode. To see these settings, either click the Advanced Mode button or configure the system to always display these settings by checking the box Show advanced fields by default in System → Advanced. Table 9.1.2 summarizes the backends which are available in the Idmap backend drop-down menu. Each backend has its own man page which gives implementation details. Since selecting the wrong backend will break Active Directory integration, a pop-up menu will appear whenever changes are made to this setting. Click the Rebuild Directory Service Cache button if a new Active Directory user needs immediate access to FreeNAS®; otherwise this occurs automatically once a day as a cron job. Active Directory places restrictions on which characters are allowed in Domain and NetBIOS names, a limits the length of those names to 15 characters. If there are problems connecting to the realm, verify that your settings do not include any disallowed characters. Also, the Administrator account password cannot contain the $ character. If a $ exists in the domain administrator’s password, kinit will report a “Password Incorrect” error and ldap_bind will report an “Invalid credentials (49)” error. It can take a few minutes after configuring the Active Directory service for the AD information to be populated to the FreeNAS® system. Once populated, the AD users and groups will be available in the drop-down menus of the Permissions screen of a volume/dataset. For performance reasons, every available user may not show in the listing. However, it will autocomplete all applicable users when typing in a username. If the wbinfo commands display the network users, but they do not show up in the drop-down menu of a Permissions screen, it may be because it is taking longer than the default ten seconds for the FreeNAS® system to join Active Directory. Try bumping up the value of AD timeout to 60 seconds. When running AD in a 2003/2008 mixed domain, refer to for instructions on how to prevent the secure channel key from becoming corrupt. Active Directory uses DNS to determine the location of the domain controllers and global catalog servers in the network. Use the host -t srv _ldap._tcp.domainname.com command to determine the network’s SRV records and, if necessary, change the weight and/or priority of the SRV record to reflect the fastest server. More information about SRV records can be found in the Technet article How DNS Support for Active Directory Works. The realm that is used depends upon the priority in the SRV DNS record, meaning that DNS can override your Active Directory settings. When unable to connect to the correct realm, check the SRV records on the DNS server. This article describes how to configure KDC discovery over DNS and provides some examples of records with differing priorities. If the cache becomes out of sync due to an AD server being taken off and back online, resync the cache using Directory Service → Active Directory → Rebuild Directory Service Cache. An expired password for the administrator account will cause kinit to fail, so ensure that the password is still valid. Also, double-check that the password on the AD account being used does not include any spaces or special symbols, and is not unusually long. If the Windows server version is lower than 2008 R2, try creating a Computer entry on the Windows server’s OU. When creating this entry, enter the FreeNAS® hostname in the name field. Make sure that it is under 15 characters and that it is the same name as the one set in the Hostname field in Network → Global Configuration and the NetBIOS Name in Directory Service → Active Directory settings. Make sure the hostname of the domain controller is set in the Domain Controller field of Directory Service → Active Directory. If the system will not join the Active Directory domain, run these commands in the order listed. If any of the commands fail or result in a traceback, create a bug report at bugs.freenas.org that includes the commands in the order in which they were run and the exact wording of the error message or traceback. sqlite3 /data/freenas-v1.db "update directoryservice_activedirectory set ad_enable=1;"
FreeNAS® includes an OpenLDAP client for accessing information from an LDAP server. An LDAP server provides directory services for finding network resources such as users and their associated permissions. Examples of LDAP servers include Microsoft Server (2000 and newer), Mac OS X Server, Novell eDirectory, and OpenLDAP running on a BSD or Linux system. If an LDAP server is running on your network, configure the FreeNAS® LDAP service so network users can authenticate to the LDAP server and have authorized access to the data stored on the FreeNAS® system. LDAP authentication for SMB shares is disabled unless the LDAP directory has been configured for and populated with Samba attributes. The most popular script for performing this task is smbldap-tools and instructions for using it can be found at The Linux Samba-OpenLDAP Howto. In addition, the LDAP server must support SSL/TLS and the certificate for the LDAP server must be imported with System → Certificates → Import Certificate. Apple’s Open Directory is an LDAP-compatible directory service into which FreeNAS® can be integrated. See FreeNAS with Open Directory in Mac OS X environments. Figure 9.2.1 shows the LDAP Configuration screen that is seen after clicking Directory Service → LDAP. Table 9.2.1 summarizes the available configuration options. Some settings are only available in Advanced Mode. To see these settings, either click the Advanced Mode button or configure the system to always display these settings by checking the box Show advanced fields by default in System → Advanced. Those who are new to LDAP terminology should skim through the OpenLDAP Software 2.4 Administrator’s Guide. 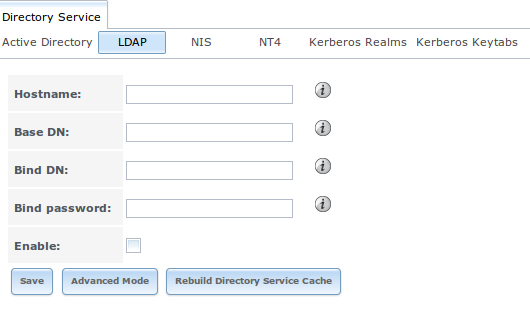 Click the Rebuild Directory Service Cache button after adding a user to LDAP who needs immediate access to FreeNAS®. Otherwise this occurs automatically once a day as a cron job. FreeNAS® automatically appends the root DN. This means that the scope and root DN should not be included when configuring the user, group, password, and machine suffixes. LDAP users and groups appear in the drop-down menus of the Permissions screen of a volume/dataset after configuring the LDAP service. Type getent passwd from Shell to verify that the users have been imported. Type getent group to verify that the groups have been imported. If the users and groups are not listed, refer to Common errors encountered when using OpenLDAP Software for common errors and how to fix them. When troubleshooting LDAP, open Shell and look for error messages in /var/log/auth.log. Network Information Service (NIS) is a service which maintains and distributes a central directory of Unix user and group information, hostnames, email aliases, and other text-based tables of information. If a NIS server is running on your network, the FreeNAS® system can be configured to import the users and groups from the NIS directory. In Windows Server 2016, Microsoft removed the Identity Management for Unix (IDMU) and NIS Server Role. See Clarification regarding the status of Identity Management for Unix (IDMU) & NIS Server Role in Windows Server 2016 Technical Preview and beyond. 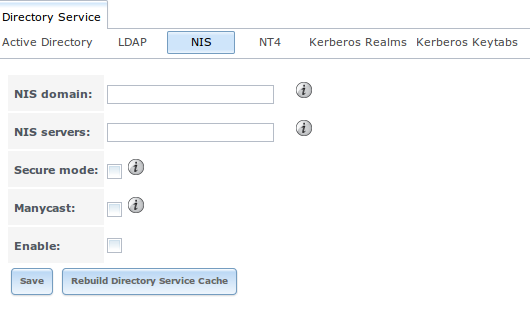 Figure 9.3.1 shows the configuration screen which opens when you click Directory Service → NIS. Table 9.3.1 summarizes the configuration options. 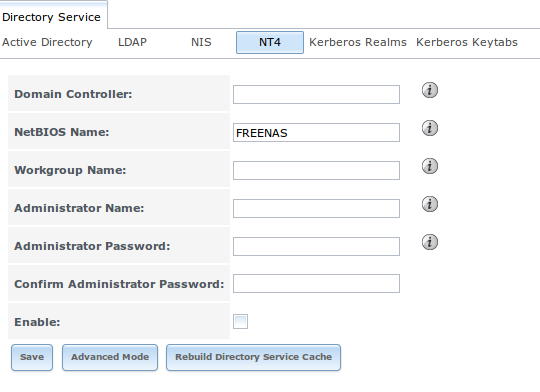 Click the Rebuild Directory Service Cache button after adding a user to NIS who needs immediate access to FreeNAS®. Otherwise this occurs automatically once a day as a cron job. This service should only be configured if the Windows network’s domain controller is running NT4. If the network’s domain controller is running a more recent version of Windows, you should configure Active Directory instead. Figure 9.4.1 shows the configuration screen that appears when Directory Service → NT4 is clicked. These options are summarized in Table 9.4.1. Some settings are only available in Advanced Mode. To see these settings, either click the Advanced Mode button or configure the system to always display these settings by checking the box Show advanced fields by default in System → Advanced. Click the Rebuild Directory Service Cache button after adding a user to Active Directory who needs immediate access to FreeNAS®. Otherwise this occurs automatically once a day as a cron job. A default Kerberos realm is created for the local system in FreeNAS®. 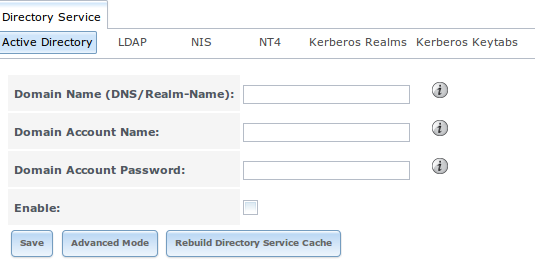 Directory Service → Kerberos Realms can be used to view and add Kerberos realms. 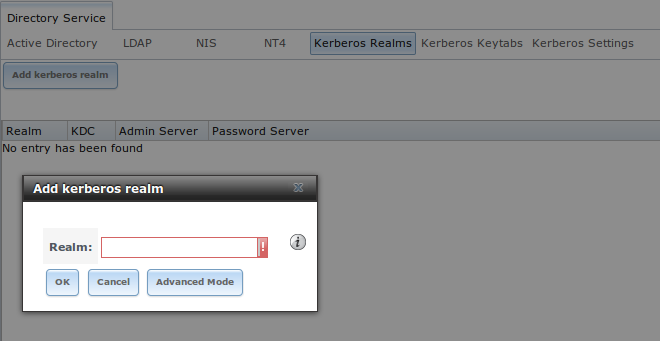 If the network contains a KDC, click the Add kerberos realm button to add the Kerberos realm. This configuration screen is shown in Figure 9.5.1. Table 9.5.1 summarizes the configurable options. Some settings are only available in Advanced Mode. To see these settings, either click the Advanced Mode button or configure the system to always display these settings by checking the box Show advanced fields by default in System → Advanced. Kerberos keytabs are used to do Active Directory or LDAP joins without a password. This means that the password for the Active Directory or LDAP administrator account does not need to be saved into the FreeNAS® configuration database, which is a security risk in some environments. This will create a keytab with sufficient privileges to grant tickets. After the keytab is generated, use Directory Service → Kerberos Keytabs → Add kerberos keytab to add it to the FreeNAS® system. To instruct the Active Directory service to use the keytab, select the installed keytab using the drop-down Kerberos keytab menu in Directory Service → Active Directory. When using a keytab with Active Directory, make sure that the “username” and “userpass” in the keytab matches the “Domain Account Name” and “Domain Account Password” fields in Directory Service → Active Directory. To instruct LDAP to use the keytab, select the installed keytab using the drop-down “Kerberos keytab” menu in Directory Service → LDAP. Appdefaults auxiliary parameters: contains settings used by some Kerberos applications. The available settings and their syntax are listed in the [appdefaults] section of krb.conf(5). Libdefaults auxiliary parameters: contains settings used by the Kerberos library. The available settings and their syntax are listed in the [libdefaults] section of krb.conf(5).